I mentioned earlier this week that I was doing a Bible Study at my church called Brave, so I thought I'd use it for this week's Bookshelf. 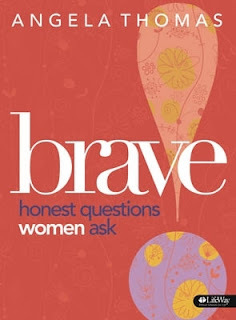 Brave--Honest Questions Women Ask...this Bible Study is all about seeking more. Going beyond your every day life and pushing for more. Asking for more. Choosing more. But to get there, you first need to be honest about where you are. The study is broken up into six weeks titled: I Am Worn Out, I Am Suffering a Thorn, I Am Undisciplined, I Am Trembling Inside, I Am Invisible, I Am Broken. From the circle of my fears, I have many times stood paralyzed in the middle when God was calling me to the edge. I have settled for safe even though God called, "Jump into My arms; I have you!" I have allowed for mediocre when I knew God wanted excellence. I gotta say, this has been a great study. I know some of you ladies from church read my blog, and if you haven't attended yet--JUMP IN! There's always room for more. And for anyone else who's interested, this study is through LifeWay. You can purchase the book and then download the teaching videos at www.lifeway.com/women. Hope you all have a wonderful weekend! Anyone doing any early 4th of July celebrating? We're all cramming like sardines into my family's cottage on a lake, letting the kids play, eating some hobo pies and smores, and trying to stay cool in this hot weather for us Northerners' standards:) What's on your agenda? I'm leaving for a week of vacation with the kids, hubby stays home until the weekend. My sister and I are taking a mini trip to St. Louis which is only an hour away from my childhood home for some book research! And my great niece turns 1, so we're celebrating!DH will be there for that. Lake time sounds fun!